Welcome to Dancing Village Productions! Get ready for Camp Fareta 2019, August 12-18! Here's some information on our philosophy and what we're about. We believe that dance is a creative, healing, expressive art meant for all to participate in and enjoy, and a community that dances together is a healthier, happier, and more harmonious community.We organize dance workshops and other events, provide deejay services, and create atmospheres that encourage people of all ages and backgrounds and from all walks of life to move and be moved on many levels. – Freestyle dance events that incorporate a wide range of music and allow people to move and dance and express themselves in a safe, nonjudgmental atmosphere. We have worked with Dance New England (dne.org) and the Northern California Dance Collective (ncdcdances.org), helping to organize their dance camps, as well as weekly freestyle dances such as Barefoot Boogie (sfbarefootboogie.com) and Dance Jam (dancejam.org). 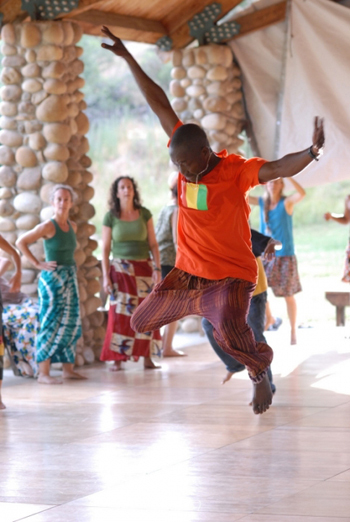 – West African cultural events We work primarily with Youssouf Koumbassa, a master dancer, choreographer, and teacher from Guinea, West Africa, organizing his tours of the west coast and southwest as well as Camp Fareta, a weeklong residential immersion in West African dance and drum.